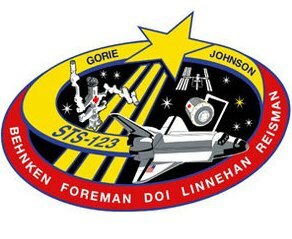 STS-123 Mission Decal. Full Colour STS-123 Mission Decal approx. 3.5" x 4"
A veteran space flier, Navy Capt. Dominic L. Gorie, will commanded the STS-123 shuttle mission to deliver the Japanese Kibo Logistics Module and the Canadian Dextre robotics system to the International Space Station. Air Force Col. Gregory H. Johnson will served as pilot. Mission specialists included Richard M. Linnehan, Air Force Maj. Robert L. Behnken, Navy Capt. Michael J. Foreman and Japan Aerospace Exploration Agency (JAXA) astronaut Takao Doi. Johnson, Behnken and Foreman made their first spaceflight. The mission also delivered NASA Astronaut Garrett Reisman to the complex and returned European Space Agency astronaut Léopold Eyharts to Earth. Launch Target: March 11, 2008. Mission Number: STS-123 (122nd space shuttle flight). Inclination/Altitude: 51.6 degrees/122 nautical miles. Primary Payload: 25th station flight (1J/A), Kibo Logistics Module, Dextre Robotics System. STS-123 will see the delivery of the first section of the Japan Aerospace Exploration Agency's new laboratory module, Kibo. Canada's new robotics system, the Special Purpose Dexterous Manipulator, or Dextre, will also be delivered to the International Space Station.